Louise and Edwin Rosskam lived in Puerto Rico from 1945 to 1953. Like the photographer Jack Delano, they initially arrived on a photo assignment – but they fell in love with the island, and decided to stay. They took thousand of photos of Puerto Rican people, places and events – and left a wonderful record of life on the island, before one million cars and countless corporations invaded it. The following image was taken in October 1945 by Louise Rosskam. There is innocence to it, and also an omen of things to come. 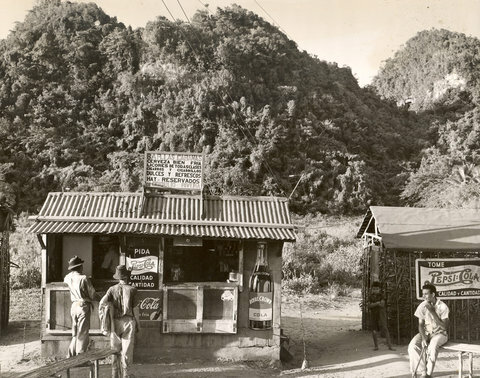 High up in the Cordillera mountain range, three corporations – Pepsi Cola, Coca Cola, and Royal Crown – were already staking their claim. The best things I like about those days. Is that people had lots of respect. Those pictures tell the story very well. Puerto Rico is and will always be the Pearl of the Caribe. Awesome mountains!! Awesome country …. Puerto Rico! !